To get just-ripe tomatoes from farm fields to markets can be tricky, and a lot of the harvest is wasted when the fruit gets over-ripe. At NC State University, scientists are exploring whether they can stall ripening, and thus reduce that waste, by changing the molecular-level machinery at work when the tomato plant perceives the hormone ethylene. 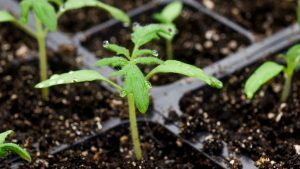 Among its many functions, ethylene regulates plant growth and stimulates fruit ripening – when plants are stressed, the hormone signals plants to slow or stop growing. Scientists know a lot about what ethylene does as genetic instructions encoded in DNA are transcribed into messenger RNAs. But little is known about what happens when the mRNAs are translated into proteins carrying out those instructions. 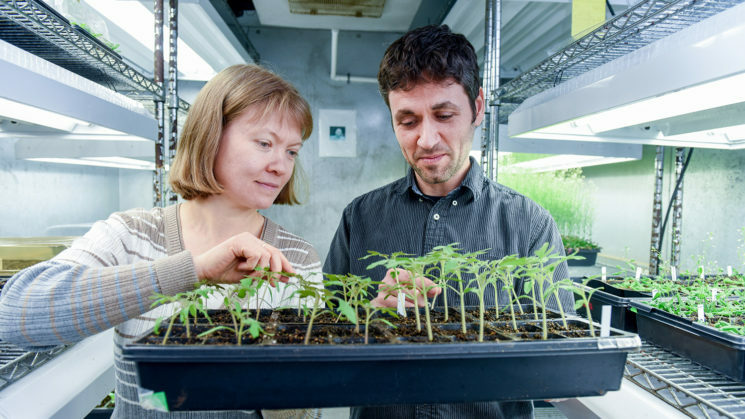 That’s where Assistant Professor Anna Stepanova and postdoctoral research scholar Javier Brumos Fuentes, of NC State’s Department of Plant and Microbial Biology, come in. With the support of grants from the National Science Foundation and the U.S. Department of Agriculture, they are using new technology, called ribosome footprinting or Ribo-Seq, to learn more about the molecular-level changes that occur across the tomato’s genome over time as the mRNAs are translated. Their goal: to see if they can use the machinery that regulates those changes to more precisely control tomato ripening. The hope is to understand which particular genes are regulated at the translational level. Once we know that, we could have a better way to regulate activity of various ripening factors. Earlier experiments with the mustard plant Arabidopsis showed that when ethylene is perceived, certain genes that function as circuit breakers of the ethylene signaling pathway are transcribed into mRNA. However, that mRNA isn’t immediately translated into proteins. Instead, it is stored until ethylene is removed. “This way, the plant is able to respond extremely fast once ethylene is not sensed. Once ethylene is gone, the signaling pathway is rapidly shut down and the plant can begin growth again,” Brumos explained. That phenomenon, which the scientists also observed in tomato growth, gave Brumos an idea: What if they could find a way to regulate processes, such as ripening, to their advantage? Specifically, they are looking at the possibility of hooking pectate lyase, a fruit-softening enzyme, to the gene elements that inhibit protein synthesis. Building on previous research done in the model plant Arabidopsis, the researchers are now experimenting with tomato plants. “The idea is to try to control the softening more precisely, so that while the fruits are being collected in the field and then transported, they’re still firm and make it to grocery stores just in time to ripen,” Stepanova added. Brumos sees significant agricultural implications for the research beyond tomatoes and beyond ripening. The findings could, for example, be used to develop technology that works on other crops and with other ethylene-influenced traits.